When I was a high schooler, I took a summer class from a wild-eyed, and equally wild-haired guy on the topic of dystopian literature in science fiction. (Nerd. Guilty as charged.) The class was great, and introduced me to tons of interesting authors and ideas, but in retrospect, I think the whole thing was a big excuse for the teacher to spend a class session listening to and discussing Rush's rock opera 2112. Now, pop music is no stranger to sci-fi tinged rock productions. From Styx's legendary Mr. Roboto to David Bowie's Ziggy Stardust, there's often been a rock and roll nod towards sci-fi sensibilities. But 2112 is an entirely different beast. Clocking in at just over twenty minutes long, 2112 can barely be described as a song. 2112 begins with a lengthy instrumental overture, segues into a fast-paced hard-rock anthem in the Priests section, and continues through seven distinct sections, telling a story of subjugation and persecution in a far-future dystopia. 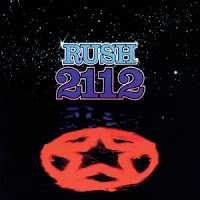 Written by Rush drummer and lyricist Neal Peart, 2112 is an extended riff on Ayn Rand's Anthem (the liner notes include a tribute to the genius of Ayn Rand), telling the story of a idealistic dreamer who tries to bring music to a harsh, authoritarian world, only to be persecuted for his discovery. Quite apart from the Rand-esque philosophy (ugh), the experience of sitting in class with a bunch of like-minded teens, listening to 2112 and discussing its significance has always stuck with me as a turning point. High school can be a tough slog, particularly for those socially underdeveloped or counterculture folks for whom the high-school years aren't the high-water mark of their lives. (In Rush's charming but slightly pretentious lyricmaking, "nowhere is the dreamer or the misfit so alone.") Experiences like this helped remind me what was on the other side of the horizon. If you got a spare twenty minutes, listen to 2112. It's worth a listen, even if you aren't trying to survive high-school as a sci-fi enthusiast. Pseudonym: Allow me to add a couple more interesting examples swirling around this genre. There are several King Crimson albums that fit this bill, perhaps most appropriately, but the definition of Progressive Rock is vague enough to encompass several other albums of note. It could be argued, for example, that Pink Floyd's The Wall fits this bill, with its imagery of a bleaky dystopia, though not necessarily set in the future. The Rolling Stones' "me too" follow-up to Sgt. Pepper, called Their Satanic Majesties Request has a sci-fi theme, and is also darker (and worse, popularly) than the cheery, upbeat Pepper. And released in 1998, Marilyn Manson's Mechanical Animals, something of a tribute to Ziggy Stardust, achieves the sci-fi bent with at least as much alacrity as David Bowie's album, hitting another chord among teenage outcasts as it combines nerdy progrock with gothcore. My own personal experience mirroring your own did not happen until freshman year of college where I was taking my figure-drawing class. The instructor seemed to only own two albums, which she played back-to-back over each of the 3 2-hour classes we had per week. Though at first it was easy to get tired of the music, the repetition allowed me to appreciate each album quite a lot (more appreciation than I had for figure-drawing, anyway), and I later purchased both albums: Built to Spill's Keep it Like a Secret, and In the Aeroplane Over the Sea, by Neutral Milk Hotel, an album steeped in its own conceptual imagery of the protagonist's identification and obsession with Anne Frank. And shut up. You were King of the Nerds, back in high school- not nerdier than the rest of us, but given a grudging respect by the other factions at school as our sort of unnofficial, somehow respectable spokesperson. Ah, dork camp at the University of Oregon. What was that teachers name? Was he still pushing "speculative fiction" as opposed to "science fiction" when you had him? "Speculative Fiction"! I love it. It's the professorial equivalent of ".... or DID it?" Whoever that guy was had to have been a neckbeard of the highest caliber and for that, I salute him. My sister and I went to Tennis Camp for summer. Not that we weren't nerds, we were just nerds who had to go to Tennis Camp instead of reading all day, and I believe our fates AS nerds were just as sealed from that experience as they would have at a sci-fi fiction class. Every so often, we'll toss up a post about something that interests us. Then, underneath each post, we'll put up our discussions of that topic. Sometimes our commentary will be informative, occasionally insightful, but most often snarky. Technology, culture, media, you name it. Call it the rest of the web: whatever we find funny, insightful or informative, we'll post here, then amuse ourselves discussing. Think of it as a commentary track for the less-important parts of the Internet. Why not instantly know what we're posting? Ist est nicht ein Wonderlic?